Xotic SL Drive distortion pedal, going for the Marshall amp sound in a tiny box. Xotic Effects SP Compressor Guitar Effects Pedal, small size but big tone. 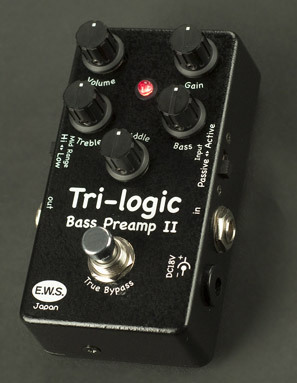 Xotic has renewed and reincarnated the "Tri-logic Bass Preamp 2". It's significantly smaller in size and more affordable. With all the same features of the former Tri-logic, 18-volts & 3-band EQ, the Tri-logic Bass Preamp 2 has evolved with improved sound quality and usability. From crunch, to mean, to down right dirty; Eric Gale's new signature Brute Drive is serious tone! But you better hurry, only 500 of these black & silver beauties will be made. Each pedal comes in its own collectors box with Eric Gale's signature pick, certificate of authenticity and free download of "Sea of Bad Blood", from Eric's latest CD "Transformation". Analog Man carries the Xotic RC Booster. We may have a limited edition Scott Henderson edition in stock. Comes with his CD, signed, and a nice display box. More info Analog Man carries the Xotic BB Preamp. Trademark Tone Without The Hassle - more distortion than AC booster. Analog Man sell the Xotic AC Booster. The super wide range gain control can change the gain amount so wide that this pedal can work as a distortion pedal when it is turned all the way up. Analog Man carries the Xotic Bass RC Booster. The Bass RC Booster has a 2 band EQ, 15dB boost / cut function and a very smooth clean boost. Order yours today!! Analog Man carries the Xotic Bass BB Preamp. The Bass BB Preamp distortion booster was designed to retain the original attack sound and tonal spectrums and produce a variety of gain structures for all bass players.